When looking for a retirement village, people often consider the many benefits that come from living in a community of like-minded peers. At Masonic Care’s Halls Head Retirement Village near Mandurah, many residents fell they have arrived at their own little piece of heaven. Resident Cath Jones has been living at the village for the past 11-and-a-half years after wanting to free up some cash for personal use and enjoyment. She said she was delighted to find the village had a keen sense of fellowship with people her own age and with similar interests. Chris and Colin Edwards have been residents for nearly three years. 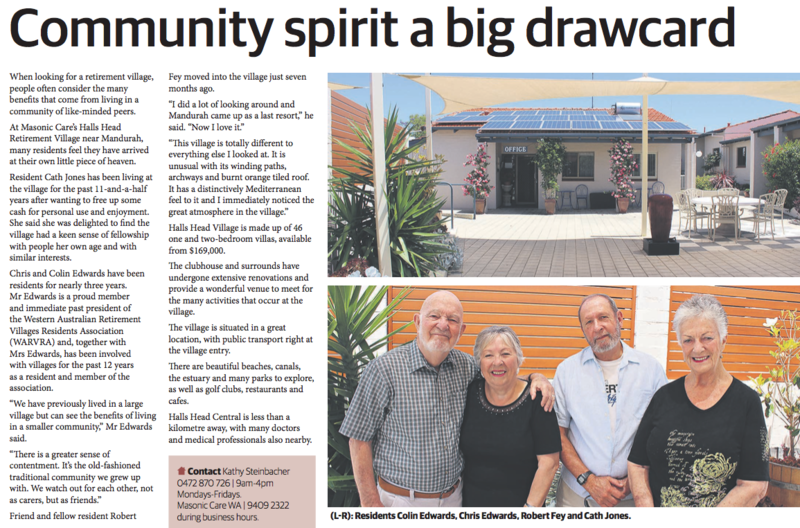 Mr Edwards is a proud member and immediate past president of the Western Australian Retirement Villages Residents Association (WARVRA) and, together with Mrs Edwards, has been involved with villages for the past 12 years as a resident and member of the association. “We have previously lived in a large village but can see the benefits of living in a smaller community,” Mr Edwards said. Halls Head Village is made up of 46 one and two bedroom villas, available from $169,000. The clubhouse and surrounds have undergone extensive renovations and provide a wonderful venue to meet for the many activities that occur at the village. The village is situated in a great location, with public transport right at the village entry. There are beautiful beaches, canals, the estuary and many parks to explore as well as golf clubs, restaurants and cafes. Halls Head Central is less than a kilometre away, with many doctors and medical professionals also nearby. Article written by Masonic Care’s own Kathy Steinbacher and edited by Chloe Vellinga, Journalist for SevenWest Creative and published in the Weekend West, West Real Estate December 23-24th 2017 edition on page 8.